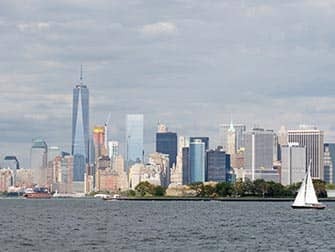 If you are not in a rush to see the sites of New York, and want to start a Sunday morning in a relaxed way then take the Champagne Brunch Sail. Not only will you be able to sip on Champagne, and have more than you can eat at the buffet, you will also be sailing on a classic ship from 1929 – the Shearwater. The ship departs from North Cove Marina in Lower Manhattan every Sunday at 11:00. Be on time and make sure you have figured out how to get to the departure point, it can be a little difficult. Take some time to stroll around Lower Manhattan as well, perhaps picking out landmarks that you want to visit later that day (9/11 Memorial, Financial District, Winter Garden, Battery Park and the Brooklyn Bridge). The Champagne brunch sail lasts around two hours in which you can enjoy the open Champagne bar, indulge in the poppy seed muffins, assorted bagels and Nova Scotia salmon among other delights. From the outside decks of the Shearwater you can take in the New York skyline – or you can sit indoors and enjoy the company of your friends, family or even fellow passengers. If you fancy it, you may even be able to help sail the ship! 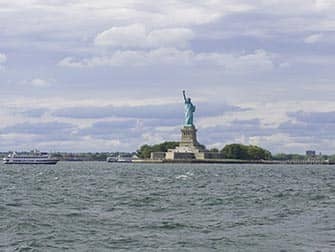 The ship sails past the Statue of Liberty, Ellis Island and the Brooklyn Bridge and stops in the harbour long enough to allow you to enjoy the view, the sun and of course the Champagne. The dress code is casual but you should dress comfy and warm: light skirts don’t mix well with the wind and hats will probably get blown away. For the ladies: don’t wear heels as not only are they not comfy on board, they can also damage the deck. Sunscreen is a must. 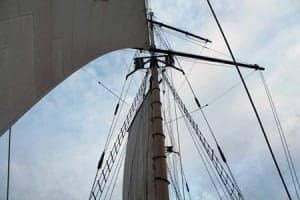 The sail ship that you’ll be travelling on is New York City’s only floating designated landmark. She has a history dating back to the early 20th century from sailing around the world to being a coast guard during World War II and she was also featured on the television show “The Apprentice” as well as in many magazines. Eric’s Tip: You need to be aware that the Sunday Champagne Brunch Sail is not a tour of Manhattan. It’s a nice relaxing trip which is perfect for starting or ending your holiday but should not be seen as an alternative to the other boat tours. If you like Champagne then it’s pretty good value for your money as it’s an open bar.